Top level management support through a product champion, and proper interfacing with the .... tual model is best shown in Fig. 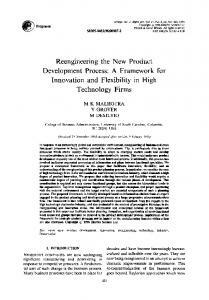 2, where four .... company's marketing group, an outside market- ...... Jancsurak J (1992) Designing for automation. the way work gets done (Davenport & Short, 1990; Davenport, 1993b;. Hammer, 1990 ..... the form of a rather conventional flowchart or process diagram. For a. According to Amazon's estimations  the expenses for energy-related .... This supports Deal inc. to digitally send their mail to ePost service which routes the. Business Process Reengineering (BPR) came up as a key concept in ..... of the contacts of all jurisdictional websites, making it possible to verify the level of. Reengineering of Construction Management Process Min-Yuan Cheng1 and Min-Hsiu Tsai2 Abstract: Applying the business process engineering philosophy, this study focuses on developing a construction management process reengineering 共CMPR兲 method to improve the efficiency of construction management. The CMPR method includes four phases, namely, process representation, process transformation, process evaluation, and reengineering activity. Using CMPR, inefficient operations within a construction company working process can not only be identified, but a new rational operation process can also be developed to improve management efficiency. In this way, the competitive ability of a construction company is also increased. This study argues for the need of a new research agenda in construction management in general. This is illustrated by information technology within construction—in particular, by examining the potential application of the reengineering philosophy. The research possibilities are identified and tested based on the implementation of the CMPR method. To some extent, this study establishes a new agenda of process reengineering for future research. DOI: 10.1061/共ASCE兲0733-9364共2003兲129:1共105兲 CE Database keywords: Construction management; Management methods. Professor, Dept. of Construction Engineering, National Taiwan Univ. of Science and Technology, P.O. Box 90-130, Taipei, Taiwan 10672, Republic of China. 2 Master, Dept. of Construction Engineering, National Taiwan Univ. of Science and Technology, P.O. Box 90-130, Taipei, Taiwan 10672, Republic of China. Note. Discussion open until July 1, 2003. Separate discussions must be submitted for individual papers. To extend the closing date by one month, a written request must be filed with the ASCE Managing Editor. The manuscript for this technical note was submitted for review and possible publication on February 29, 2000; approved on November 29, 2001. This technical note is part of the Journal of Construction Engineering and Management, Vol. 129, No. 1, February 1, 2003. ©ASCE, ISSN 0733-9364/2003/1-105–114/$18.00. The fundamental definition of BPR as defined by Hammer is that starting from the very basic issues, reformation of the reengineering process will dramatically improve an organization in terms of its cost, quality, service, and speed. Therefore, improvement and reengineering of the process is a fundamental tenet of BPR. The construction management process is a necessary procedure in construction companies’ execution of their business. An inefficient management process will have a profound impact on a company’s management performance. However, most business owners are not able to properly determine a correct process. They fail to establish the system effectively or even to understand whether the system itself is reasonable and effective. These problems result in a redundancy of business operations and are a waste of valuable human and time resources. This can render management ineffective to the degree that those individuals may not know how to improve their predicament. Computerization is receiving increased awareness in the construction industry and has become the focus of development for many construction companies. However, many business owners fail to properly examine existing management procedures and seek to improve them before implementing computerization. As a result, the structure of computerization is built upon a foundation of a false working procedure. The result is a failure of the management procedure, which precipitates the malfunction of computerization. As is apparent in the above, the prudence and efficiency of a management process have a direct influence on the success of computerization. Thus, if management is better able to evaluate the existing management process and address deficiencies before the implementation of automation or the establishment of a standard operation process, the likelihood of computerization’s success will be greatly increased. 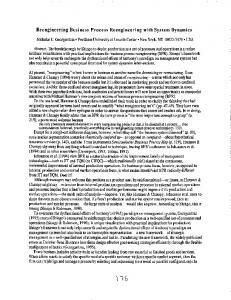 This paper redefines the definition and description each scholar has provided of process reengineering by the following criteria 共Davenport and Short 1990; Furey 1993; Harrison and Pratt 1993兲: ‘‘use of customer satisfaction as the primary target and examination of the information technology and operational process within and between organizations; and use of process analysis as a means to understand process performance and redesign the process in order to reach the target of simplification, cost reduction, and improvement of the service quality.’’ To effectively raise management performance in construction companies, it is necessary to begin by researching related processes. Construction companies can start by considering the method of reengineering to improve the quality of management—and thereby their competitiveness. The primary purpose of this study is to use the idea of BPR to develop a construction management process reengineering 共CMPR兲 model. Using CMPR, the major procedural categories of construction company management are systematically identified and defined. Further aims include the formulation of a method for evaluating the construction management process, and establishment of indices for procedural performance to assist managers in realizing the hidden problems of the process and to use the findings as the basis for comparative analysis before and after reengineering. Finally, by the analysis of the current management problems of construction companies and establishment of the delivery of the management information technology system, one can draft and evaluate a reasonable and effective management plan. This study can serve as a basis from which to execute operation procedures, implement computerization, and plan methods of the management procedure. tion of related activities to further represent and clarify the range of the primary process. Based on these analysis results, managers can better understand the contents of their operations. This study uses the ‘‘data entity/operation function matrix’’ method to analyze the relationship between business functions and data subjects to clarify and name a company’s procedural categories. Development of Data EntityÕOperation Function Matrix. The business functions are defined based on the organizational structure diagram and the departmental function data. The worksheets and documents regarding interdepartmental activities are collected and categorized according to subject in order to determine the company’s data subject. Using construction company A as an example, this study, by analysis of departmental responsibility and function, summarizes the company’s business function in seven main categories, listed based on the operational sequence in the first column of Table 1. The functions of each category are also identified and listed in the second column. In addition, the data subjects derived from the formats and types of departmental charts, worksheets, and reports are grouped and listed at the top of the table. The corresponding relations between functions and data are then filled in to complete the matrix. In the table, ‘‘create’’ 共C兲 means produce data, ‘‘read’’ 共R兲 means read data, ‘‘update’’ 共U兲 means renew data, and ‘‘delete’’ 共D兲 means delete data. Rearrangement of Matrix. Because read, update, and delete all use an existing data subject as the target of execution, for existing data, the above actions can also be treated as read. Before rearranging the matrix, then, replace the R, U, and D characters with R. Rearrange the functions column according to the operation sequence of the company and adjust the order of data subjects to allow the C to be represented from the top left to the bottom right. In process reengineering, one of the most difficult and important tasks is to identify and establish a company’s process. The current system adopts the method of departmental function that divides up originally related activities. Some construction company managers are employed to manage the company based on their experience and habits. Under these circumstances, it is often difficult, if not impossible, for them to accurately describe the categorized operational process. Therefore, the primary purpose of process representation is to develop a systematic definition for process to assist companies in clarifying and establishing their management process. Two major steps are included in this model. Definition of Name of Process. According to the matrix after rearrangement, the data subjects are grouped in several nonoverlapping divisional frames. These frames are the clarification of the processes. Then, based on the functional category and characteristics grouped in each divisional frame, the process can be named and the company’s operational process category is determined. The eight core management processes of company A are identified and shown in Fig. 1. By the establishment of the matrix, the company can not only set the range of main business function processes, but it can also examine the data delivery process by the relationship between function and data. Using the financial accounting management process and the operation management process as examples, the budget planning function has to refer to read the financial income, financial expenses, and sales data in order to create information regarding the financial budget. Sales data actually belong to a set of data created by the operation management process. The relationship between these two processes is apparent. Likewise, the main data delivery process is established using the same method. This study pioneers the idea of BPR in the construction industry for management process reengineering by developing a CMPR execution model 共Sager 1994兲. This model includes the following four major steps: 共1兲 process representation; 共2兲 process transformation; 共3兲 process evaluation; and 共4兲 process redesign. where k⫽number of process; i⫽number of criterion; AW i ⫽weight of criterion i; and P ki ⫽process k score for i criterion. 共IF兲; 共6兲 loop 共L兲; 共7兲 parallel 共P兲; 共8兲 conflict 共C兲; and 共9兲 no relationship 共X兲 共Construction Industry Institute 1993兲. The reasons for classification for the operational relationship are represented in eight items—namely, use common input data 共code 1兲, need some output to proceed to the next step 共code 2兲, need common equipment 共code 3兲, need common staff 共code 4兲, use common space 共code 5兲, need information feedback 共code 6兲, data effects of the process on the next activity 共code 7兲, and need the decision from the prior step to proceed 共code 8兲. Based on the eight classification reasons, an operational relationship matrix 共ORM兲 is developed to systematically establish the relationships between operations, and is used as a reference for drafting the IDEF0 diagram. Using the second level of activities identified in Fig. 2 as an example, the development of the IDEF0 diagram for the procurement/subcontracting process is described. As shown in the figure, this diagram is composed of four functions, including ask for purchase, quotation and negotiation, inspect, and sign contract. Fig. 3 is the ORM developed to illustrate the relationships between these four operations. The quotation and negotiation can only be done after the ask for purchase has been completed. According to the IDEF0 operational relationships and classification reasons, the relationship between these two operations is coded as 7, which represents the relationship of IC. Likewise, the remaining relationships between operations are identified and filled in to complete the matrix. Based on the matrix, the example IDEF0 diagram for the procurement/subcontracting process can be drafted as shown in Fig. 4.
herent in the subjective definitions can be avoided. The types of characteristics sorted by this study include 共1兲 value-added and non-value-added; and 共2兲 primary and secondary. 1. Value-added and non-value-added. An activity producing value that is of use to external customers is called a valuedadded activity. The opposite is called a non-value-added activity. For external customers, demand satisfaction is a direct method to produce value. Therefore, this study uses process targets in the PTAM that are of some contribution to the external customer demands to discern whether or not the activity has value-added characteristics. In Fig. 5, regarding the case of the procurement/subcontracting process, the owner’s 共external customer兲 demand is quality purchase. The four process targets, namely, reasonable purchase schedule, vendors evaluation standards, thoroughness/completeness of bidding content, and establish faultless contract 共the gray shaded items兲, have a contribution to the owner’s demand. It is concluded that the process targets listed in the gray area can satisfy the external customer demands. Then, based on the PTAM as shown in Fig. 6, the six operations that have a contribution to the four process targets are purchase/ subcontracting plan development, fill purchase orders, subcontractor search, build/edit subcontractor namelist, subcontractor evaluation, and sign contract. These six activities are defined as value-added, whereas the rest are non-valueadded. 2. Primary and secondary. A primary activity is a direct supporting task of the process. The opposite is called a secondary activity. The score of the relative importance weight W i obtained in Fig. 5 is used to define the primary and secondary targets. The activities supporting the primary targets in Fig. 6 are then selected as primary activities. Referring to the 80/20 principle, this study identifies the activities completing 80% of the process targets and defines them as primary activities. Hence, the process targets are arranged in descending order of W i scores to find the first 80% of the primary targets. By use of the PTAM, the activities supporting the primary targets are then identified and defined as primary activities. Identification of Resources Used by Each Activity. The cost of an activity is derived from the use of resources in each activity. This study adopts IDEF0 as the tool to describe the process. process is the internal operational process of the company. The owner does not directly participate in the operation of this process. The main focus of the process management is internal coordination, and thus the weighting of W v is 0.4. Using Eq. 共8兲, the CI of the procurement/subcontracting process for company A is calculated and totals 61.52.
where W TA⫽weight of function evaluation; W Cl⫽weight of cost evaluation; and W TA⫹W Cl⫽1. In Eq. 共9兲, W TA and W Cl are used to assist managers in determining the weights of functional effectiveness and cost efficiency. Construction company A, considering that effectiveness and efficiency are of equal importance, sets the weights of W TA and W CI at 0.5 each. Based on the results of the function and cost evaluation, the PV of procurement/subcontracting for the company is calculated and totals 77.8. From the functional evaluation results, the procurement process has a lower level of OA i in terms of purchase budget control 共Fig. 6兲. The reason is that in the current process, the functions of all activities are not able to pinpoint and deal with a circumstance in which the purchase budget exceeds the execution budget. The low process value of the procurement/subcontracting process is due to the fact that the cost evaluation is too low. This is caused by the fact that this process has more non-value-added and secondary activities. In other words, the main bottleneck of the process is the failure to transform the cost to the target value as demanded by the owners. It is important to seek strategies for improvement of this specific problem. suitable to a company’s needs. Using the same process as an example, the process is shown to be weak, in that there are too many compliance, non-value-added, and secondary activities. Hence, in order to reduce compliance activities, a computerized system must provide functions that give the precise purchase category, quantity, and schedule information data. Moreover, to lower the cost of non-value-added and secondary activities, the management system should have related functions that provide price inquiry, price comparison, price negotiation, and vendor information. In consideration of the above suggestions, this study believes that company A should develop a computerized system that includes functions such as planning the procurement/subcontracting schedule, providing market price data, controlling the budget, and recording the quantity of construction. The system should also be able to provide correct timing and quantity of procurement/ subcontracting in order to reduce compliance activities and decrease the cost of non-value-added and secondary activities executed manually. In addition, budget execution can be controlled by checking the completed quantity of construction to make up for the deficiency of budget control in the process. process reengineering as well as methods of execution, this study provides construction companies with a valuable reference for internal management process reengineering. With the development of the CMPR model, this study establishes a new research area for process reengineering in the construction industry and serves as a basis from which business managers can execute operation procedures, implement computerization, and plan methods of management procedures for companies. References Construction Industry Institute. 共1993兲. ‘‘Modeling pre-project planning for the construction of capital facilities.’’ Source Document 94, Univ. of Texas at Austin. Davenport, T. H., and Short, J. E. 共1990兲. ‘‘The new industrial engineering: Information technology and business process redesign.’’ Sloan Manage. Rev., 11–27. Farrell, J. 共1994兲. 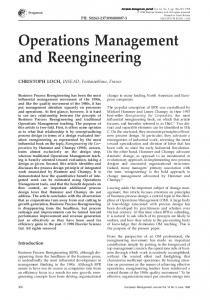 ‘‘A practical guide for implementing reengineering.’’ Planning Review, 40– 45. Freiser, T. J. 共1992兲. ‘‘The right start for business reengineering.’’ Information Strategy, 9共1兲, 26 –30. Furey, T. R. 共1993兲. ‘‘A six-step guide to process reengineering.’’ Planning Review, 20–23. Hammer, M. 共1990兲. ‘‘Reengineering work: Don’t automate, obliterate.’’ Harvard Business Review, 104 –112. Hammer, M., and Champy, J. 共1993兲. Reengineering the corporation—A manifesto for business revolution, HarperCollins, New York. Hammer, M., and Stanton, S. A. 共1995兲. The reengineering revolution—A handbook, HarperCollins, New York. Harrison, D. B., and Pratt, M. D. 共1993兲. 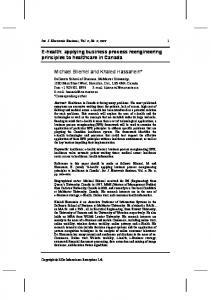 ‘‘A methodology for reengineering business.’’ Planning Review, 6 –10. Martin, J. 共1989兲. Information engineering. Book II: Planning and analysis, Prentice-Hall, Englewood Cliffs, N.J. Sager, I. 共1994兲. ‘‘The few, the true, the blue.’’ Bus. Week, 124 –126. Report "Reengineering of Construction Management Process - CiteSeerX"